I’ve tried multiple times to write something well thought-out about Steven Universe, but other than my review for Save the Light, I’ve never been able to. Video games are my area of comfort for writing, and it’s hard for me to write about other media. Perhaps I’ll write a beautiful essay on just why Steven Universe is awesome one day, but that day is not today. 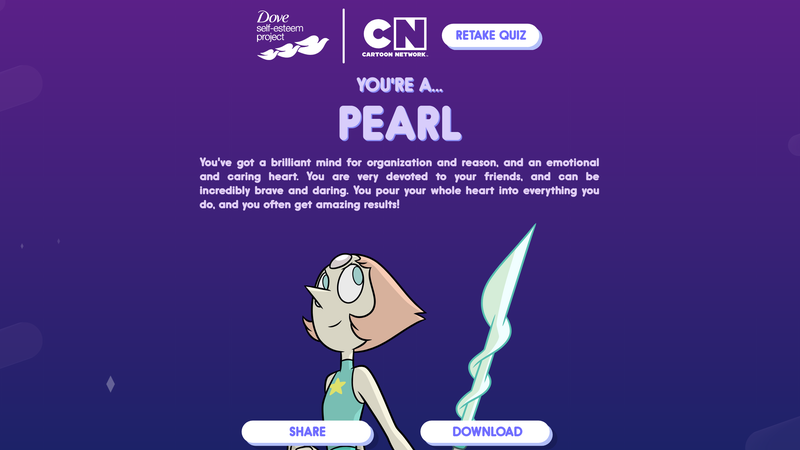 Instead, I took an online quiz and found out that I’m most like Pearl! I honestly thought I’d end up more like Steven, because we’re both energetic, outgoing, and… well yeah, we’re both teenage boys, even if Steven’s vocal range is a little higher up than mine. But I love all of the Crystal Gems, and Pearl’s no exception. She’s a little infamous for being “salty,” but she’s also really caring and adorable. I wear my Pearl badge with pride. This official quiz was made in part by the Dove (you know, the soaps and such) self-esteem project, which aims to empower young girls to feel confident about their body image. They’ve made three of six planned shorts showing different characters talking, or even singing, about being confident with their own bodies, with tons of fourth-wall breaking and plenty of cute moments. The art style’s a bit weird, especially with some characters, but it’s great that they’re giving such a good message to young audiences. The body-positivity message is less obvious in the quiz, but no matter which character you get, the description is overwhelmingly positive. I mean, damn, I just said which season I like best and now I’m being told I have a “brilliant mind for organization and reason” (lol) and “I’m emotional and caring.” But that’s kinda the point with this positivity-boosting thing, and I absolutely support it. What Crystal Gem are you? If you don’t watch Steven Universe, how completely nonplussed are you? Take the quiz here and let me know in the comments! P.P.S. I just realized that the result says “You’re a Pearl,” not just “You’re Pearl.” This might suggest that you’re just one of the many Pearls or Amethysts on Homeworld and not the member of the Crystal Gems. Ooooor I’m putting way too much thought into a quiz meant to sell soap. P.S. I wrote this early, so I had NO IDEA there was going to be a movie announced! I don’t really have time to go in-depth on it, but AHHHHHHHHHHHHHHHHHHHHHHHHHHHHHHHHHHHHH!!!!!!! Please feel free to geek out over that as well.